Brooks Ghost 11 Review. 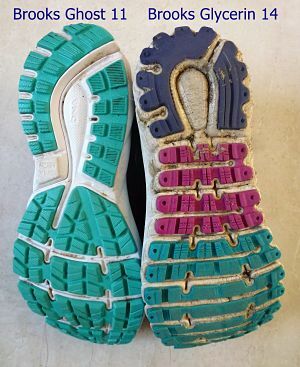 As a female and wearing Brooks Ghost running shoes for the first time, I was excited to see how they fared. For a bit of background, I am a female runner, wears neutral running shoes and who runs trail and road and runs distances from 5k to ultra marathon. I have had a few niggling injuries over the past few years so choosing my running shoes has become quite an important part of my running life. I already own a pair of Brooks Glycerin 14 shoes which are my favorite running shoes, but they are sadly on their way out. So for a change, I decided to try the Brooks Ghost 11. Straight out the box, I liked how light they feel. In fact on my kitchen scales a size 39eu weighs 248gm so lighter than my Brooks Glycerin 14 which weigh 264gm and which I thought were already great. Now this was a slight worry to me as I normally like running shoes under 10mm but the Brooks Ghost 11 have a heel to toe drop of 12mm. As I so really wanted to try them out, I reasoned that the drop was going to stop my Achilles playing up. 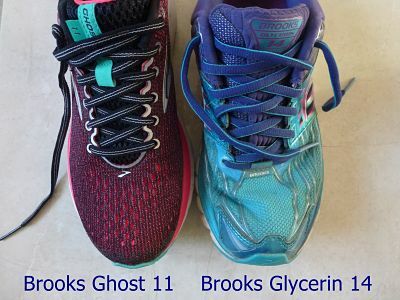 The Brooks Ghost 11 shoes are not as cushioned as the Brooks Glycerin 14 (although pretty close) but that can be a good thing, especially if you run shorter fast races where you need to feel a sense of contact with the ground. Yes I want to run fast please! Apparently the outer sole looks the same as the previous model (which I don't have). They look grippy and with a decent tread for unpredictable ground or weather. These definitely look narrower around the toe are as compared to my Brooks Glycerin 14 shoes. However the sizing overall seems the same. I bought a size 39eu as I do with all my running shoes. By the way I normally wear a size 37-38eu in my everyday shoes. The color is a sort of dark pink purple. Not too girly and dark enough to hide the dirt. Style wise, I am not that blown away but not upset with them either. They are not a shoe that is going to turn heads but still, they are fine. 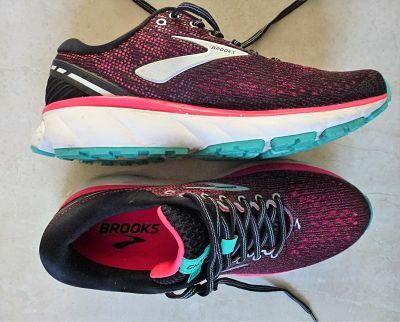 I am not going to tell you about all the different materials used for cushioning or in the midsole as you can find that information quite easily on the Brooks website. For me, the most important thing is how do they feel on the run and do they suit my needs. I have now run just under 100km in the Brooks Ghost 11 so I feel that I have a pretty good idea of what I like and perhaps don't like about them. I've mostly run on road or paths and in all weather conditions. First off, putting the shoes on I noticed that the laces are flat as compared to my Brooks Glycerin, which are tube shaped. I actually prefer flat laces as they tend to hold better. They are plenty long enough too, especially if you like to do a double knot. The heel cup at the back does seem a bit loose like it is not quite holding my heel down but in fact whilst running I don't notice it. I have not taken them out on very muddy ground so I do fear that my heel could lift up a bit. The cushioning that I had been promised kind of felt a bit disappointing. The insoles just feel a bit hard and even after nearly 100km, I would say the same thing. I guess I am comparing them to the Brooks Glycerin shoes which are the king of cushioning. I was worried about the 12mm toe to heel drop being a bit much for me but in fact, I don't even notice the difference compared to my other running shoes. Over the past few years I have made a concerted effort to break out of heel striking and I don't feel that the Brooks Ghost 11 made me heel strike any more than usual. I've done a couple of 20km runs in these shoes and I have not had any problems with blisters or sore areas. Even in the rain, the shoes did not rub and what's more, my feet stayed pretty dry. On the track when doing sprints, the Brooks Ghost felt light and much as I wished they would make me run like a gazelle, they didn't. In terms of grip, I've not tested them to their limits but on wet tarmac, the shoes coped well and did not have me sliding around or feeling hesitant. For a lightweight shoe that is comfortable out of the box, I give the Brooks Ghost 11 top marks. If you want lots of cushioning, I would say that the Brooks Glycerin might be a better shoe for you. In terms of sizing and toe room, the sizes seem true so go by your normal running shoe size. The toe box might be a bit narrow for some people especially if you have wide or splayed out feet. If you like bright shoes then you might find the colour choices quite muted. Brooks Ghost 11 Review : What do you think?